Here are good news for those candidates who are looking for Govt teaching job in Rajasthan State. So that first time Rajasthan Education organization going to recruit direct placement of Principal in various Govt school of Rajasthan. This news is official announced by Vinod Mital on 20th March 2017 in local news press. Rajasthan Education committee board doing that first time because after do that the control of education will going to today’s youth hands and after that youth will teach the various students according to their laws and principle. Eligible candidates can start applying online form for Rajasthan School principal recruitment 2017 because opportunity for total numbers of 1855 Posts Recruitment is very huge and everyone can apply for Rajasthan principal Vacancy 2017 but the main condition set by official is that they must be eligible for filling online application form. Recently Rajasthan education organization has also conduct written exam for 15000 3rd grade teacher recruitment. 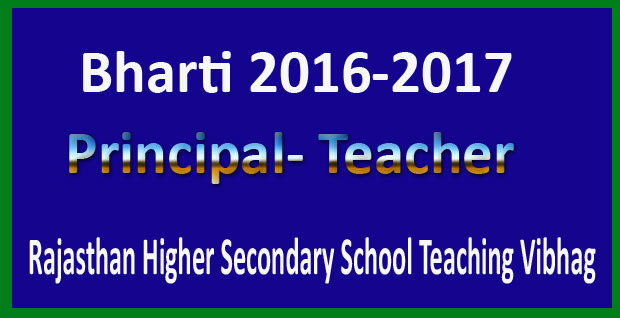 Many candidates have appeared in 3rd grade REET teacher examination 2015-16. For applying for Rajasthan School teacher Recruitment 2017 Posts candidates should have 5 years experience and having degree of B.Ed and graduation. Many candidates are going to appear in Rajasthan Principal Examination 2017. Shortly Rajasthan Higher Secondary School Teaching Vibhag is going to issue online application form on its web portal. This time Rajasthan education organization is going to recruit 1855 posts of principal. This is best opportunity for those candidates who have completed their education and having much experience of teaching field so they can easily applied for Principal posts. These posts are filled by 75% promotions and 25% by direct hiring process. Before apply candidates must be read all important details of recruitment from application form like post eligibility, education criteria, age limit, application fee, pay scale and selection procedure. Soon Rajasthan education organization will updates all details of Principal recruitment 2017 on its web site, so candidates need to touch with it and get all details of Rajasthan education placement 2017 when it will release. Lots of candidates are curiously waiting for online application form and wants to apply of Principal posts, shortly they can able to apply principal posts according to their education criteria. There are 9588 schools of Higher Secondary Level in the state of Rajasthan and currently 7733 schools already have able guidance by their respective principals, who are teach very well too many students in many Govt schools of Rajasthan State. Every year Rajasthan Education department has released many placement of teaching field in much govt school of Rajasthan and gives opportunity to everyone to proof them through written examination of various teaching posts. Aim of Rajasthan Education organization to fill the entire empty vacancies in their departments and provide good education to students through eligible & capable teaching staff. Rajasthan School principal recruitment apply online 2017 Links are started online and eligible candidates can start filling online form for Rajasthan principal Vacancy only by visiting official web Page Rajasthan Education Portal. Candidates soon will get all updates when Rajasthan education Vibhag released fully detailed on its official notification of principal teacher placement 2017. Candidates those have query related to that how to apply online, direct important link, important dates, education qualification, age limit, experience limit, application fee, so they will check official website for knowing to Bharti process / procedure. Soon Rajasthan education Vibhag will be publish exam date of Principal examination on its web portal. After applying all candidates can check their Exam Pattern & syllabus from official web Page of Rajasthan Education organization, It’s very tough job to select eligible candidates for Principal posts in their department. Rajasthan education department is very respectful organization where lots of people will come and make their future in teaching profession. Only few candidates will selected by organization because Principal jobs is very difficult job so only some qualified candidates will selected by written test & personal interview. Those candidates will be selected by organization for principal posts then on their shoulder have much responsibilities of education department. Now eligible candidates can apply online application form for Rajasthan School principal recruitment 2017, So fast up guys and apply online application form for Rajasthan principal Vacancy 2017. I am also looking for this vacancy anyone have authentic information please do tell. Principal ki vigypati kab tak aa rahi h, please tell me about it. I am also waiting for this if you have any authentic information please do share.